John Pilger once wrote of Edward Bernays, the founder of modern propaganda: "Bernays' influence extended far beyond advertising. His greatest success was his role in convincing the American public to join the slaughter of the First World War. The secret, he said, was "engineering the consent" of people in order to "control and regiment [them] according to our will without their knowing about it. He described this as "the true ruling power in our society" and called it an "invisible government." 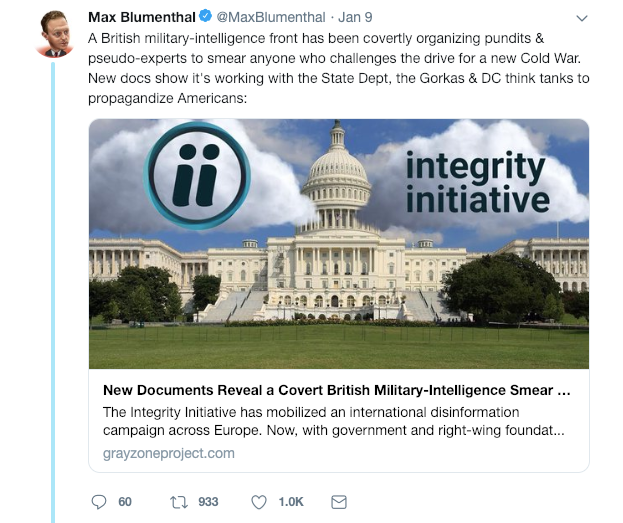 Grayzone's Mohamed Elmaazi and Max Blumenthal summarized the scandal, writing: "Recent hacked documents have revealed an international network of politicians, journalists, academics, researchers and military officers, all engaged in highly deceptive covert propaganda campaigns funded by the British Foreign and Commonwealth Office (FCO), NATO, Facebook and hardline national security institutions... The whole operation appears to be run by, and in conjunction with, members of British military intelligence... The exposing of the Integrity Initiative has just scratched the surface of what appears to be a much more sophisticated, insidious, and extremely online version of Operation Mockingbird." In the weeks following the hack, major narratives pushed by the legacy press in the last two years have been exposed as state-friendly propaganda, including but not limited to: Russiagate, the Skripal poisoning, the smearing of Jeremy Corbyn, and the pushback against the Catalan independence movement. Grayzone also illustrated the group's ties to Trump-insiders Katharine and Sebastian Gorka and neoconservative interests, detailing the direct involvement of the State Department's Todd Leventhal. The Integrity Initiative was not only involved with propagandizing against Russia. The group also interfered in American politics, according to Grayzone: "It is clear that the influence operation has already been activated in the US. Hacked documents reveal that the Integrity Initiative is cultivating powerful allies inside the State Department, top DC think tanks, the FBI and the DHS, where it has gained access to Katharine Gorka and her husband, the fascist-linked cable news pundit Sebastian Gorka." The World Socialist Website described the sources of funding for the Initiative, writing: " ... with £1.96 million from the FCO and the rest from the US State Department, NATO and the American neoconservative Smith Richardson Foundation. Facebook, which plays an integral role in imposing censorship on behalf of US imperialism, donated £100,000." Despite the story's historic significance of the scandal, Western corporate media's glaring refusal to cover the story requires little explanation. 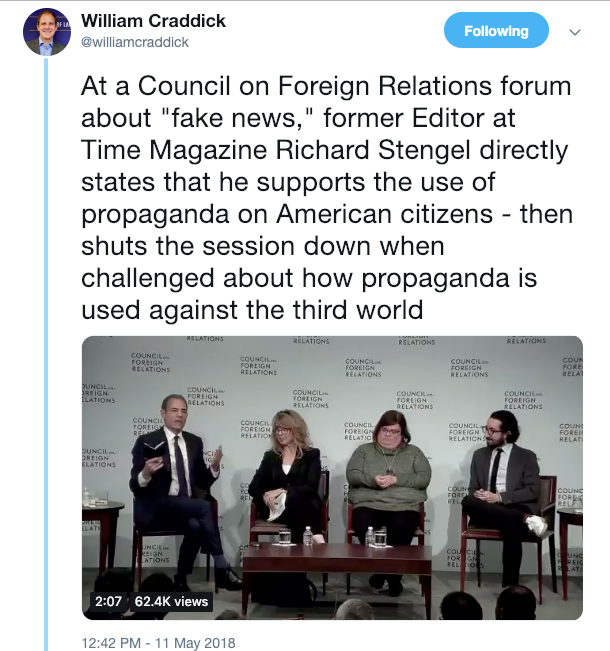 Disobedient Media's William Craddick noted last year that Robert Stengel, a former Editor of Time Magazine revealed in the leak to be tied to the Integrity Initiative via the Global Engagement Center and Todd Leventhal, had publicly advocated for the use of domestic propaganda. Virtually simultaneous to the revelations stemming from the anonymously hacked documents, Disobedient Media's William Craddick also reported allegations that a British intelligence asset had infiltrated right-wing outlets including the Voice of Europe. The report was not the first time that British influence has been noted interfering in various US affairs. "Is British intelligence involvement in RussiaGate, as outlined above, the international version of CrowdStrike and former FBI figures manufacturing the Guccifer 2.0 persona specifically to smear WikiLeaks via false allegations of a Russian hack of the DNC? Have we been looking in the wrong place – at the wrong country – to unearth the so-called ‘foreign meddling’ in the 2016 US election all along?" "As perceived throughout 2016, Donald Trump and his enunciated views on Muslims constituted a threat to cohesion within the United Kingdom as well as to its external affairs, for if Trump became President, a continuance of the special relationship between Britain and America could undercut Britain’s position vis-à-vis the nation’s burgeoning Muslim population as well as its relations with Muslim-majority nations. If Britain were to suspend its special relationship with America in the wake of a Trump presidency, the island nation’s economy and security could suffer grievous harm. Further, the next British monarch might be precluded from becoming the head of the Commonwealth of Nations due to friction with Muslim-majority members incensed by Washington. Thus, both courses appeared unacceptable." Levine added: "It may therefore be contended that former or current operatives, with decades-long associations with American and British intelligence, took part in activities, which one of these individuals alleged was penetrated by Russia. Of course, these persons were not part of the Trump campaign or presidency: rather they are connected to the CIA, the FBI, and MI6." Grayzone writes of the Integrity Initiative's focus on drumming up specifically neo-mccarthyist fervor: "The Integrity Initiative has sought to organize journalists across the West into an international echo chamber hyping up the supposed threat of Russian disinformation—and to defame politicians and journalists critical of this new Cold War campaign." "On February 10th, 2017, an article distributed by the Atlantic Council’s Digital Forensics Lab attacked research published by Disobedient Media concerning the EU and added the Atlantic Council to a line of media houses and other outlets who deny the Wikileaks and Harvard Human Rights Journal supported research collected and published by Disobedient Media exposing the role that the Clintons and Department of State played in helping Laura Silsby and her co-conspirators off the hook after they were caught smuggling children illegally out of Haiti." Disobedient Media's coverage of the EU Army in particular noted the role of NATO in supplying the new fighting force with equipment and weaponry that was being shipped to Europe under the auspices of Operation Atlantic Resolve. Atlantic Resolve is an ongoing NATO operation intended to counteract Russia, a major geostrategic opponent of the United Kingdom. It should be of little surprise to anyone that British government propaganda programs would attack Disobedient Media's coverage of operations that have allowed them to use the United States as a proxy in their centuries-long competition with Russia for political dominance both in Europe and around the globe. The smear attempt continued: "Now that same medium and those same employees have launched to disseminate information about the Catalan crisis, often interacting with Assange himself. On September 15 they published a new in which they made false claims that the cancellation of the referendum has cast doubt on the permanence of Spain in the EU, that the Spanish government has restricted press freedom or that Amnesty International has condemned the illegal vote on the independence. The news ends with a photo of Francisco Franco on horseback and its author refers to "the enduring influence of the fascist dictator Francisco Franco in Spanish politics." That same author, Elizabeth Lea Vos (@ElizabethleaVos) shared his information in Twitter seven days ago with messages like "Where is the EU's response to Spanish authoritarianism?" "By showing the real sources of information on which they rely, newspapers like El País or El Mundo are exposed as conduits of the intelligence services to support the suppression of maverick political viewpoints... Last year, El País carried out a frenzied and paranoid campaign claiming that the Catalan crisis was not sparked by the Popular Party government’s violent repression of the secessionists, but was the result of Moscow and its “fake news.” It quoted experts and specialists working for Spanish think tanks like Instituto Elcano and Barcelona Centre for International Affairs (CIDOB), and the European Council on Foreign Relations. The leaked documents show that many members of these think tanks are members of the “Spanish Cluster” of the Integrity Initiative." It appears that El Pais's attack on this author and Disobedient Media was likely a part of the now-unmasked efforts of the Integrity Initiative's to propagandize against anyone critical of the West or their allies. El Pais's attempt to tie this author and Disobedient Media to the so-called "digital army of the Kremlin" didn't so much as attempt to provide a single tie between this author or Disobedient Media and Russia, much less the Russian government. However, it would not be the last time that this outlet would be accused of acting on behalf of Russia despite all evidence to the contrary. Last year, Disobedient Media's technical correspondent was shamelessly doxxed and attacked in a hit-piece authored by Duncan Campbell. Campbell, much like the Atlantic Council, similarly attacked Disobedient Media's coverage of the EU Army and ties between certain British officials and organizations linked to terrorist networks. While multiple writers have since thoroughly debunked the claims made in Campbell's farce of an article, Carter informed this writer that shortly before the piece was published, a photographer and journalist from the Sunday Times appeared at his residence unannounced. This would suggest that the journalists in question had been tipped off as to Carter's real identity and address, as well as the imminent publication of Campbell's report. Carter added that shortly after Campbell's article was published, he received a follow-up email from Sunday Times reporter Ian Williams. Fascinatingly, Ian Williams is part of the 'Russian Outer Core group of II' described in the Integrity Initiative scandal. While Carter cannot confirm that Ian Williams was the same reporter who appeared on his doorstep just prior to the publication of Campbell's article, it is nonetheless relatively predictable that a reporter associated with the Integrity Initiative's efforts to propagandize against Russia would seize on Campbell's ad-hominem-drenched hysteria. It goes without saying that Disobedient Media is far from the only outlet targeted by organizations and individuals associated with the Integrity Initiative. However, by discussing the targeting of this single, minor independent outlet, one realizes the gravity of state-backed resources devoting to smearing domestic, independent voices. It provides a piece of a larger pattern seen repetitively across the independent media sphere, wherein critical thinkers are attacked viciously under the guise of "protecting democracy" and "countering pro-Russia talking-points." If the incestuous relationship between the State and corporate world hadn't already been proven, the revelation of this nefarious project should put the final nail in the coffin of the separation between technocracy, plutocracy and governance.